20 inch double drawn weaves curly hair extensions are made from 100% Vietnamese Remy hair. They are chosen carefully from Vietnam top quality human hair. These hair extensions are natural, strong, no shedding and tangle-free with nice scent. 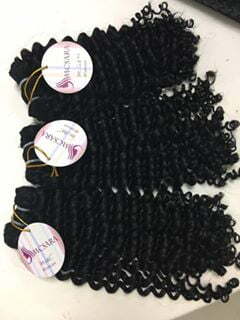 Double drawn curly hair is formed by hot steam system with no chemical and the black color is completely original. It’s a better and quicker way for you to put on a new hairstyle. These hair extensions are great to add volume to your growth hair. Double drawn hair extensions have beautiful end. It will give an extra fabulous appearance and can combine perfectly with your own natural hair. The hair extensions are pure clean material which easy to use, take care and storage. We provide these hair extensions worldwide with secure payment methods, convenient shipping and hospitably customer care. We focus on the quality of each product; therefore, you have the right to put your belief in our hair extensions and services.